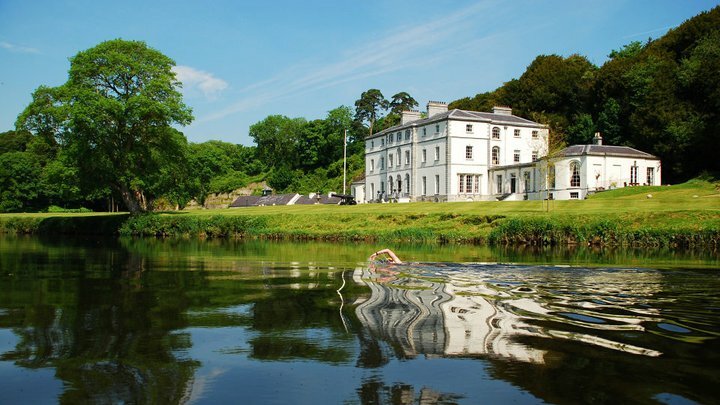 Last Friday evening, I took part in what was my first Martin Duggan Memorial Swim in the beautiful River Blackwater. I’ve been organising this event since it before it changed its name from the “Blackwater Swim” in 2009 so have been present at every swim but never actually taken part. 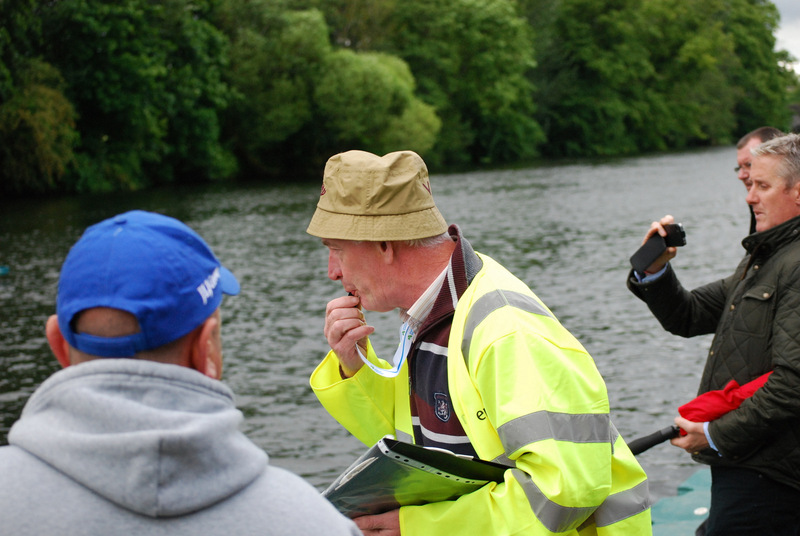 This year, however, I was able to place the running of the event in the very capable hands of Brigid Noonan and Jim Sheehan while I took a half-hour beak from the organisation to see how the swim looks from the swimmers’ point of view! Our referee, Jim Sheehan, gets the proceedings underway. We split swimmers into two starting groups for safety. Bryan Keane (left) and Gavin Noble (right) are first swimmers home at MDMS 2013. The first swimmer home was Ireland’s top triathlete Gavin Noble (Sandycove Island SC) who completed the 2 km in a new course record of 23 minutes 32.7 seconds! Not far behind him was fellow elite triathlete Bryan Keane (Templeogue SC). I was very pleased to be the next swimmer home, finishing in 26 minutes 50.1 seconds. This is my best time over this course, which I swim practically every day during the fine weather! 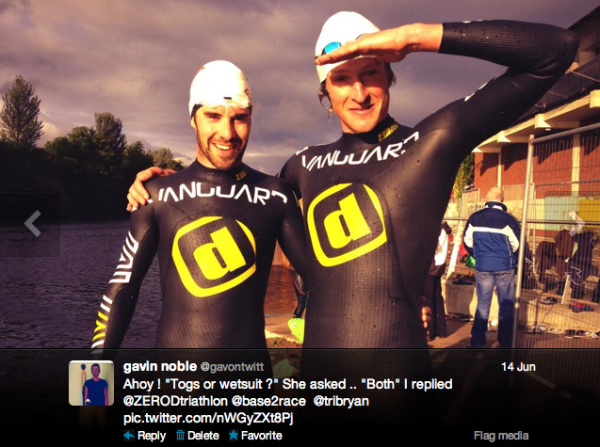 It was good to be the first non-wetsuit and, more importantly, non-elite swimmer home! I really enjoyed the race, though, especially having abstained from participating for the first four years of its existence. I was very pleased also that everyone else seemed to enjoy their swim and that the event can attract some top-class athletes. You can find full results of the swim on Results 2013 and more photographs on our Facebook page. Me finishing the swim in third place overall and first non-wetsuit, but none of that really matters once I beat Ned, which I did! 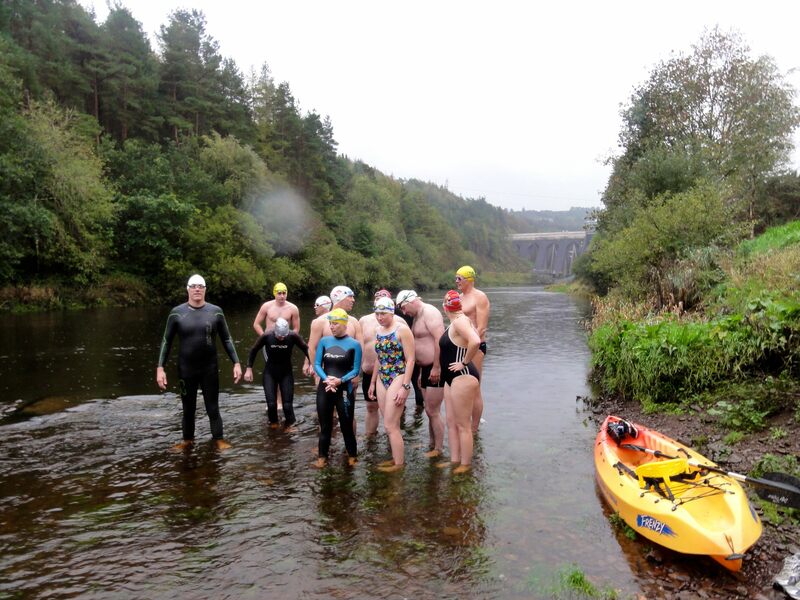 There was a great turnout of Fermoy SC swimmers also – total of 18 swimmers from both the Masters and Torpedoes squads. The next Fermoy SC swimmer after me was Paul Noonan who swam 29 minutes 2.1 seconds for the 2 km – sub-30 isn’t too bad for someone “not racing” but this is the same guy that “accidentally” swam the 5 km instead of the 3 km at GaddinAbtGarnish last weekend… There was some great swimming also by Grace Corbett, who swam 31 minutes 11.1 seconds (non-wetsuit) for this, her first ever open water at only 12 years of age, beating a handful of older and more-experienced club swimmers! 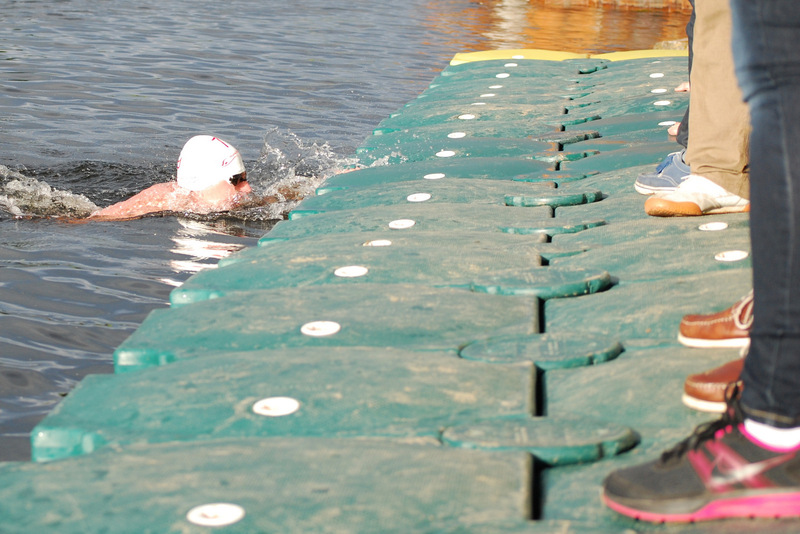 This was also a first open water race for Mary Brooks and Anna Sheehan, both of whom swam very well. Mary won the Martin Duggan Memorial Shield for the Youngest Swimmer as she was just 12 years 170 days old on the day of the swim. There were some impressive swims also by a couple of the Masters squad swimmers for whom this was their first proper event in the open water. Some swimmers at the finish pontoon, including Fermoy SC members Anna Sheehan, Declan O’Keeffe, Kurt Malmstrom and Mona Sexton, as well as Conor Power (Carrick Dippers SC) and Una McIntosh (Cork Masters SC). 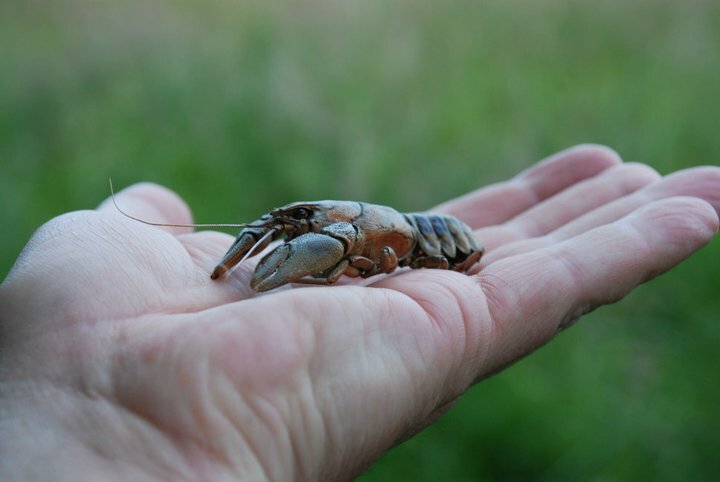 There are lots of people to whom great thanks is owed as regards running this event but I’m not going to thank them here – they’ve been thanked on the event’s own websites (first two articles linked below). I would, however, like to personally thank both Brigid Noonan and Dave Mulcahy who do a lot of the background work on this swim. I wouldn’t have a hope of keeping this event going without their help. Thanks, Brigid & Dave! On Thursday, 19th July, conditions finally came right to try the first swim. Maeve Mulcahy of Dolphin SC kindly agreed to kayak for me. Taking the swim as 18.6 km, as it appears on the map, I prepared feeds to last for five hours. However, as soon as we arrived at the Rowing Club, we could see that we would be done well within that time! There had been a lot of rain recently so there was a good flow in the River. Another cause for relief was that the water temperature had increased from 10ºC to about 14ºC in the last week. 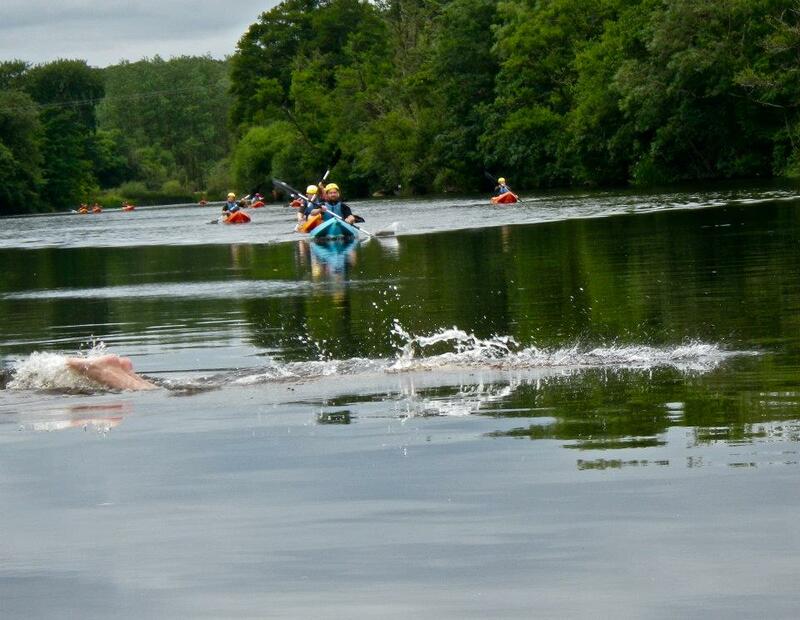 Our first obstacle came no more than 200 m into the swim in the form of Fermoy Weir. There is no way around this impressive structure, so the only solution is to slide down it. Maeve went over first in the kayak and I followed. 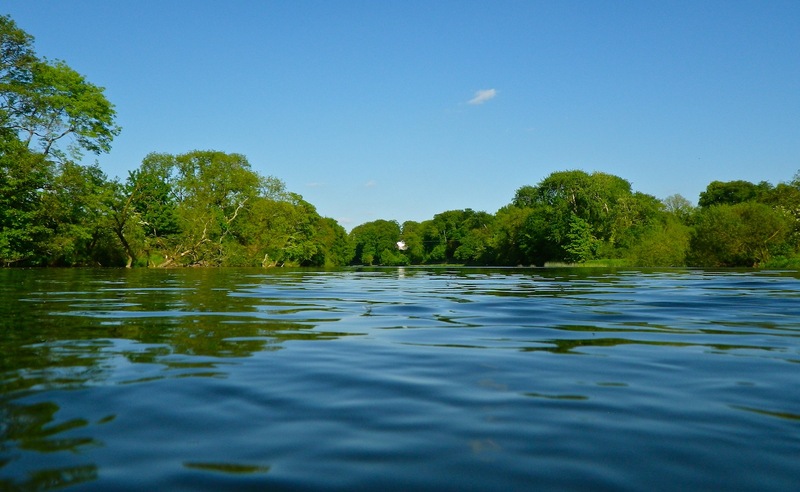 Once safely at the bottom of the Weir, we navigated under Fermoy Bridge and through a large set of gravel islands, using the current to our advantage. After this turbulent beginning, there is 5 km of deep, slow-moving water. 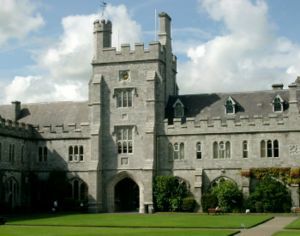 Landmarks on this stretch include the huge M8 motorway bridge, Fermoy’s Sewage Treatment Plant, Carrigabrick Viaduct, Isleclash House, Halloran’s Rock (one of the many distinctive limestone cliffs on the Blackwater) and the confluences with the Funcheon and Araglin Rivers. 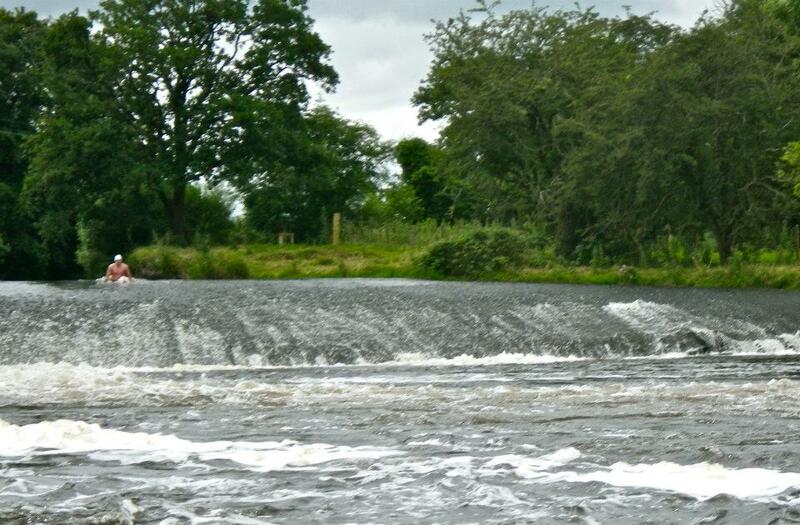 The next major obstacle is Clondulane Weir, similar in design to Fermoy Weir. Two of my great-granduncles drowned at this Weir, something I wasn’t aware of while sliding down it at considerable speed! 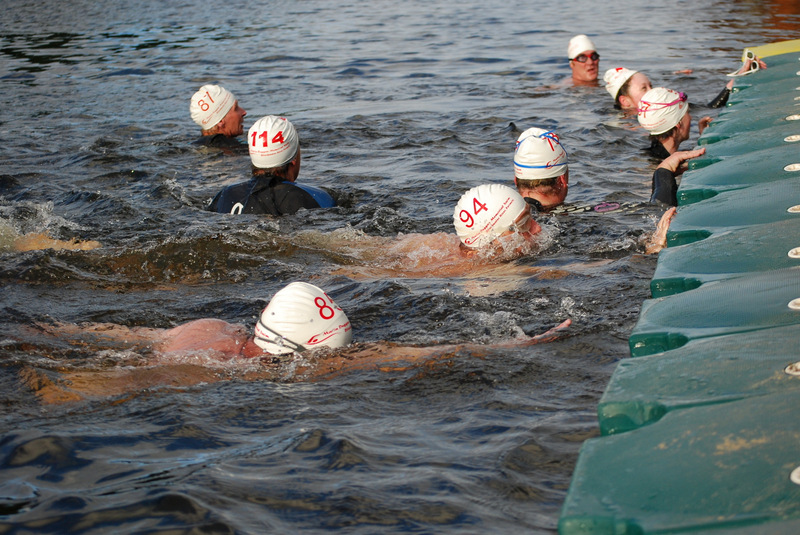 There are very strong currents just below the Weir, which make swimming a bit tricky. The area just downstream of the Weir is known as Careysville and is very famous amongst game fishermen for its Atlantic salmon. We continued on this stretch of shallow, fast water, passing fishermen’s huts along the banks. Swimming along the boundary between Counties Cork and Waterford, a fisherman asked me if I was doing the swim as part of a triathlon! It had been very overcast at the start of the swim, but it did start to brighten up at this stage. 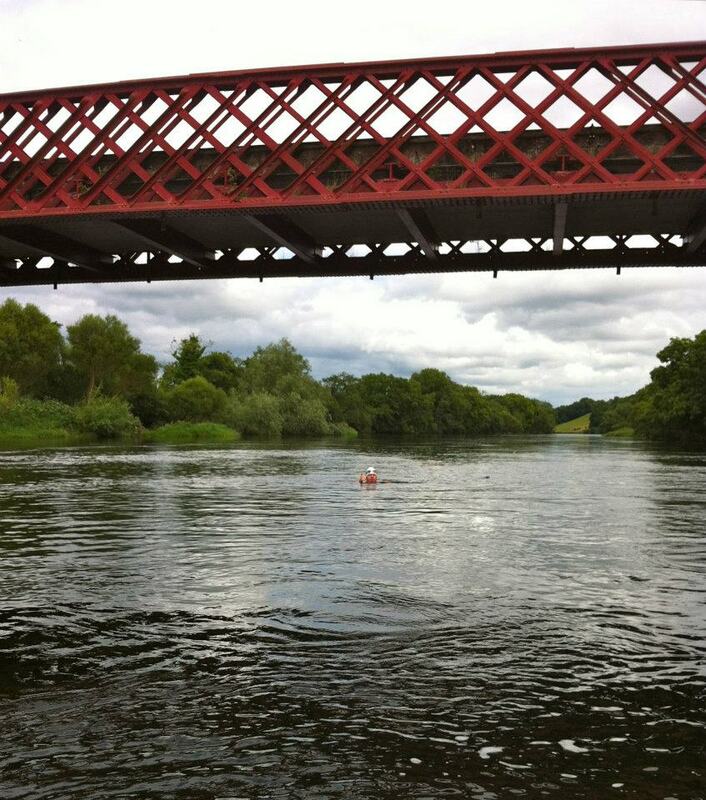 Going under the red iron bridge in Ballyduff just before the end of the swim. The finish point was on the right, just below Ballyduff Bridge. At this point, Maeve called out the swim time: 2 hours 41 minutes 5 seconds. I was completely amazed – this was an hour less than it had taken us to kayak the same route just a few weeks beforehand! We were greeted at the finish by three geese and some lambs. Needless to say, the geese were far more vocal in their “welcome” than the lambs!